Born September 19, 1908, Helsinki. Died August 26, 1979, Helsinki. Waltari, the Egyptian et al. Mika Waltari was born in Helsinki in 1908. His father died when he was six, so the boy’s education was put in the hands of his mother Olga Johansson and his uncle Toivo. Waltari’s childhood circumstances had a strong influence on his writing. The main character is often depicted as having an absent father and a close relation to the mother. His uncle Toivo had a decisive influence on Waltari’s decision to become a writer. It was at his initiative that the Finnish Seamen’s Mission commissioned the young writer to produce his first work, a novella on a Biblical theme entitled Jumalaa Paossa (‘Flight from God’, 1925). Waltari’s literary breakthrough came with his fifth work, a first novel called Suuri Illusioni (‘The Great Illusion’, 1928). The book dealt with restless youth and modern urbanity, It became a sales hit, as well as a critical success, and was translated into a number of languages. It has been compared favourably to Ernest Hemingway in its depiction of the 1920s. Waltari’s ambition as an artist was to produce novels. In his estimation the novel form offered the best way to describe human life’s most important facet: development. Aside from his writing career, Waltari worked for Finland's State information office during the Second World War. In wartime he wrote political propaganda, for which he was given access to classified material by the state’s police and military intelligence. The theme of the propaganda centred on Russian espionage in Finland and the occupation of the Baltic states. In the interlude of peace he wrote Totuus Virosta, Latviasta ja Liettuasta (‘The truth about Estonia, Latvia and Lithuania’, 1941) under the pseudonym Nauticus, and during the Continuation War he wrote Neuvostovakoilun varjossa (‘In the shadow of Soviet espionage’, 1942), this time under his own name. 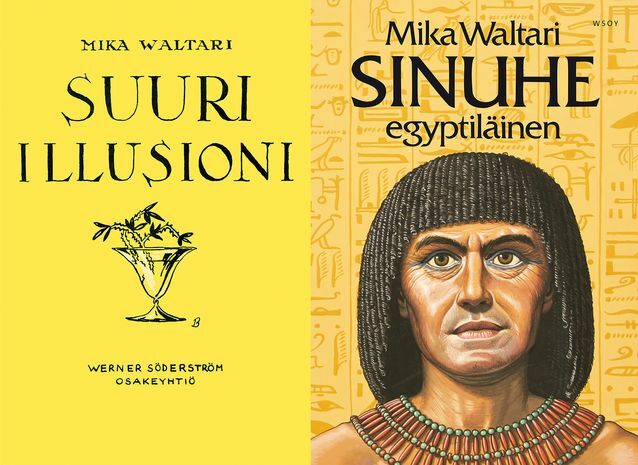 At the end of the War Waltari wrote a historical novel set in Egypt, Sinuhe, egyptiläinen (The Egyptian, 1945). With this novel Waltari rose to international fame. When the work was translated into English in 1949, it topped the American bestseller list where it remained for six months. Around the world, The Egyptian is the highest-selling Finnish novel, and has been translated into over 40 languages. Waltari wrote a total of eight historical novels. He was instrumental in creating a new style of historical novel in postwar Finland. These did not so much deal with nationalistic, Finnish topics but given the political conditions, safer and internationally speaking more interesting topics. His output extended to include the gamut of literary genres, all the way from the Komisario Palmu detective thrillers to fairy tales. Mika Waltari’s writerly trajectory finished on the same theme it had begun with. His last great work was the religious novel Ihmiskunnan viholliset (The Roman, 1964). It dealt with the spread of Christianity in ancient Rome and the persecution of the Jews. In later life waltari was preoccupied with his duties as a member of the Academy of Finland. He was tired and plagued by illness, so he never did complete his historical novel on the knights of Malta. Panu Rajala, Unio Mystica. Mika Waltarin elämä ja teokset, Helsinki 2008. Panu Rajala, Mika Waltari 1908 – 1979, Mika Waltari Society, online publication. Accessed March 4, 2015. Markku Envall, Mika Waltari, Lasipalatsin mediakeskus. Accessed March 4, 2015. Markku Envall, ’Waltari, Mika’. National Biography of Finland online. Accessed March 4, 2015. Risto Niemi-Pynttäri, Mika Waltarin historialliset romaanit, University of Jyväskylä, Koppa online publication. Accessed March 3, 2015. By Written by Tomas Sjöblom. Translated by John Calton.